I’m participating in the Dark Days Challenge this year. What do you mean, you’ve never heard of it? Okay, I hadn’t either until about a month ago. Here’s a quick summary: you try to make one meal a week using SOLE (sustainable, organic, local [within about 100 or so miles], ethical) ingredients, then write about it. Yep, that’s it. Of course, easier said than done, particularly here in Ohio where just about nothing grows during the winter (not everything necessarily needs to be local – spices or chocolate, for example – but that’s where the sustainable/ethical part comes in; just do the best you can). Fortunately, there are a few year-round farmer’s markets, including the one at Shaker Square, so we should be able to manage to get some produce there. I sense lots of greens and root veggies on the menu. We’ve kinda been trying to eat this way more anyways over the past couple years. For us, meals seem to be more satisfying when it’s something we’ve picked from right outside or meat from a local farm. So this is just kind of a good way to keep us on track, and also see what other like-minded people are up to. 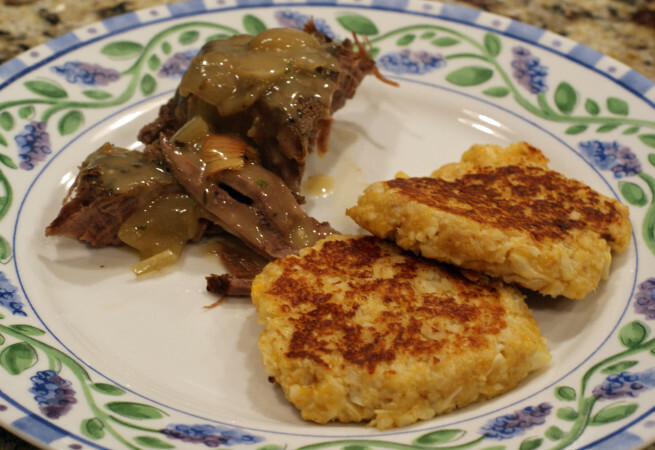 For the kick-off meal, we had an English roast (cut of beef) with cauliflower pancakes. The beef is left from the split-half we purchased last year, and produce/herbs are either from outside or the market. Butter is from Hartzler’s dairy. We don’t have any place to source flour, so that’s from the store. Rub salt and pepper into the roast. In a Dutch oven, melt the butter and brown the roast on both sides (few minutes per side). Add the sage, mint, garlic, and onions to the pan, along with a small amount of water (1/4 – 1/2 cup). Cover the pot and place in a preheated oven – bake at 350 F for 2 to 3 hours, depending on your desired level of doneness. I did about 2 1/2 hours and there was no pink left in the center. To make the gravy, first melt the butter in a medium saucepan. Whisk the flour into the butter until smooth. Remove from the heat, and stir in water. Mix again until smooth. Return to heat, and add the sage and mint. Add the liquid from the roasting pan and bring to a boil, stirring until the gravy thickens up. Slice or pull apart the roast, and serve with the gravy and cauliflower pancakes. The eggs are from my parents. We don’t have a local cheddar cheese guy either (most of the cheeses at the market are soft whites), so that’s from the store as well. Cut the cauliflower into florets. The recipe calls for boiling (or steaming), but I roasted them because I like the flavor better. A couple downsides to roasting – it takes significantly longer than steaming, and it didn’t leave me with a nice “mashable” texture (boiling or steaming will pretty much turn the cauliflower to mush, while roasting leaves it a little firmer), so I had to use the food processor. Mash (or blend; just make sure it’s in tiny pieces) the cauliflower, and add in the eggs, breadcrumbs, cheese, and seasonings. Mix well – it’s a pretty sticky combo. Form the mixture into smallish patties (3-4 inches) and cook on an oiled griddle or skillet. Cook for a few minutes per side, until lightly browned, and firm enough that they’re not falling apart. This made about ten pancakes. Thanks for following along – I’m hoping this challenge makes the winter a little more bearable! The cauliflower pancakes actually sound good! So happy that you’re joining us. This meal sounds wonderful, cauliflower pancakes would be great as I love all things cauliflower! Thanks for the recipe!